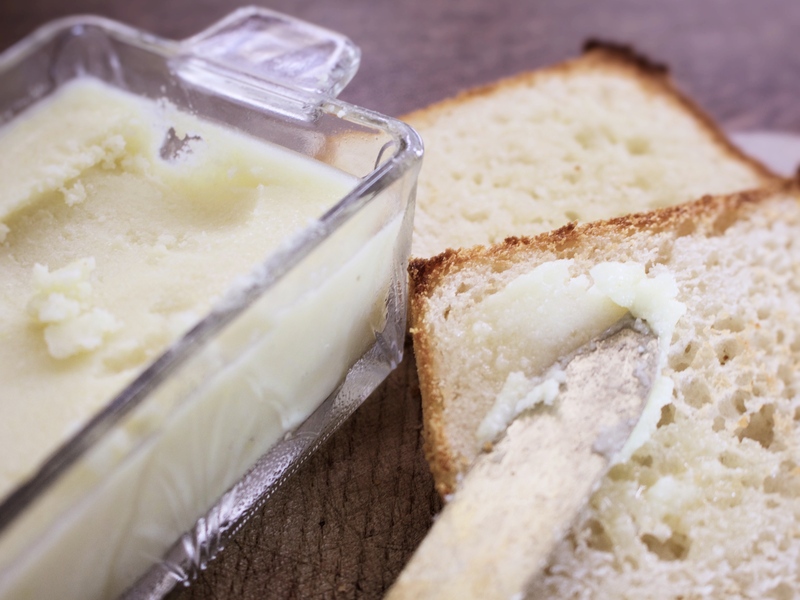 Lets face it, butter is an essential part of the kitchen and it can be tricky with out it when you are on a dairy-free diet. This is why I’m excited to share this vegan dairy-free butter recipe, its like sooooo super easy to make and it takes no time at all. You will most likely have the ingredients in the cupboard already, or you can easily pick them up in the supermarket. I recommend using between 1 to 2 teaspoons of salt for this recipe, but play around with the amount and adjust it to your own taste. Re-use an old butter tub for your vegan butter or find yourself a nice butter dish, charity shops are the perfect place for this… I picked mine up for a squid! Soft, tasty and easy to spread, I don’t think this recipe will disappoint. Slowly melt the coconut oil on a medium heat, then set aside to cool a little. Mix the almonds and almond milk into a thick paste, then add the salt and the apple cider vinegar. Pour the coconut oil over the almond paste, mix, then add the olive oil and a pinch of turmeric. Pour into your chosen butter dish and chill until set. Approximately 30 minutes.